The 9K720 Iskander (Russian: «Искандер»; NATO reporting name SS-26 Stone) is a mobile short-range ballistic missile system produced and deployed by the Russian Federation. The road-mobile Iskander was the second attempt to replace the Scud missile. The first attempt, the Oka, was eliminated under the INF Treaty. The Iskander appears to have several different conventional warheads, including a cluster munitions warhead, a fuel-air explosive enhanced-blast warhead, a high explosive-fragmentation warhead, an earth penetrator for bunker busting and an electromagnetic pulse device for anti-radar missions. The missile can also carry nuclear warheads. The first successful launch occurred in 1996. In 2006, serial production of the Iskander-M Tactical Ballistic Missile System launched, and the system was adopted by the Russian army. The cost of the rocket decreased by 30% in 2014. A number of countries were attempting to secure arms deals for the Iskander system, beginning in 2011, with the most likely contenders being China, India and South Korea. Targets can be located not only by satellite and aircraft but also by a conventional intelligence center, by an artillery observer or from aerial photos scanned into a computer. The missiles can be re-targeted during flight in the case of engaging mobile targets. Another unique feature of Iskander-M  is the optically guided warhead, which can also be controlled by encrypted radio transmission, including such as those from AWACS or UAV. The electro-optical guidance system provides a self-homing capability. The missile's on-board computer receives images of the target, then locks onto the target with its sight and descends towards it at supersonic speed. Boost phase thrust vector control (TVC) is accomplished by graphite vanes similar in layout to the V-2 and Scud series tactical ballistic missiles. In flight, the missile follows a quasi-ballistic path, performing evasive maneuvers in the terminal phase of flight and releasing decoys in order to penetrate missile defense systems. The missile never leaves the atmosphere as it follows a relatively flat trajectory. The missile is controlled during the whole flight with gas-dynamic and aerodynamic control surfaces. It uses a small scattering surface, special coatings and small size projections to reduce its radar signature. The Russian Iskander-M travels at hypersonic speed of 2100–2600 m/s (Mach 6–7) at a height of 50 km. The Iskander-M weighs 4615 kg, carries a warhead of 710–800 kg, has a range of 500 km and achieves a circular error probable (CEP) of 5–7 meters. During flight it can maneuver at different altitudes and trajectories and can turn at up to 20 to 30 G to evade anti-ballistic missiles. For example, in one of the trajectory modes it can dive at the target at 90 degrees at the rate of 700–800 m/s performing anti-ABM maneuvers. The missile is controlled in all phases. Iskander has achieved sufficient accuracy, range and reliability (ability to penetrate defenses) to function as an alternative to precision bombing for air forces that cannot expect to launch bombing or cruise missile fire missions reliably in the face of superior enemy fighters and air defenses. Training and competence requirements are much lower than for normal air force assets such as a fighter bomber squadron utilizing guided bombs. Iskander is a tactical missile system designed to be used in theater level conflicts. It is intended to use conventional or nuclear warheads for the engagement of small and area targets (both moving and stationary), such as hostile fire weapons, air and antimissile defense weapons, command posts and communications nodes and troops in concentration areas, among others. The system can therefore destroy both active military units and targets to degrade the enemy's capability to wage war. In 2007, a new missile for the system (and launcher), the R-500 (range of applications up to 2000 km and more) cruise missile, was test fired. Now complex "Iskander-M" is transmitted to the troops complete with cruise and ballistic missiles. In 2013, army missile brigades first received missiles equipped with a new control system. When approaching the target false targets and small jammers separate from the rocket. The missile uses stealth technology. Iskander-M also carries a complex of electronic warfare jamming devices, both passive and active, for the suppression of the enemy's radar. The system can be transported by any means of transport, not excluding airplanes. According to the Moscow reports, the Moscow Defense Brief stated that an Iskander missile was used for a high precision strike on the Georgian Separate Tank Battalion base in Gori, destroying 28 tanks. Russian officials have denied using of the Iskander missile against Georgia but official reports testify to the high effectiveness of the Iskander missiles, as one of the most devastating and accurate weapons in the Russian arsenal. The Dutch government's investigation claims that a single, 5 mm fragment from an anti-personnel sub-munition, that was propelled by an Iskander missile, killed Dutch journalist Stan Storimans in Gori, which was home to various military targets and had been almost completely evacuated before the bombardment. In November 2008, the Russian President Dmitry Medvedev stated in his first state of the nation speech, that Russia would deploy Iskander missiles to Russia's western district of Kaliningrad "to neutralize, if necessary, a NATO missile defense system." On 17 September 2009, US president Barack Obama announced the cancellation of the US missile defense project in Poland and the Czech Republic. 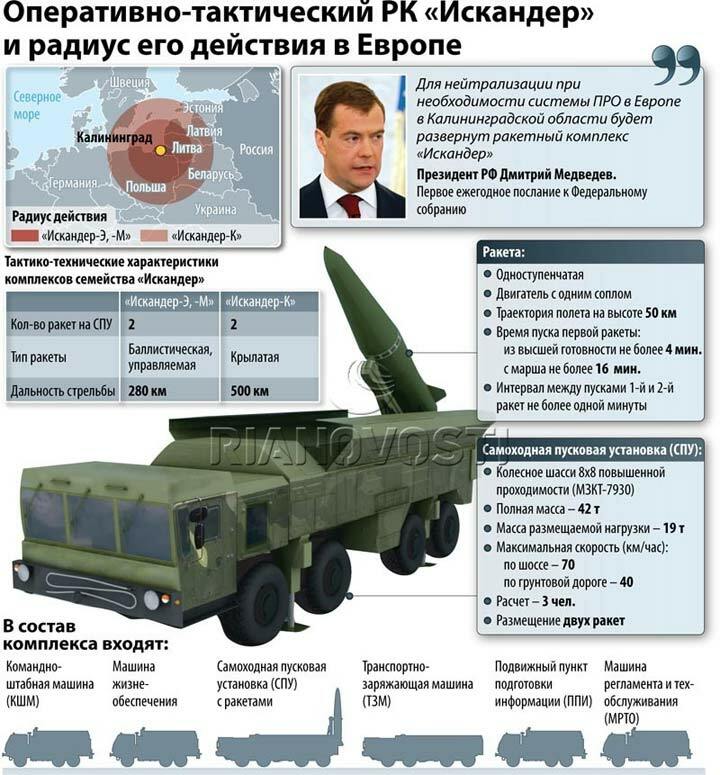 Following the announcement, on 26 September, Medvedev stated in a press conference that he would in turn cancel the plans to deploy Iskander missiles to Kaliningrad. According to Stratfor.com e-mails from 2009 there are a number of Iskander brigades operational. In June 2013, it was revealed that Russia had deployed several Iskander-M ballistic missile systems in Armenia at undisclosed locations throughout the country. In March 2016, at least one Iskander system was deployed to the Russian airbase Hmeimim in Syria. 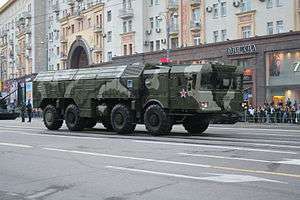 On 29 September 2009, the Russian military announced plans to set up an extensive network of Iskander missiles throughout the country as part of the broader military reforms underway. According to General Vladimir Boldyrev (rtd. ), Iskander systems would be stationed in every military district in Russia but not in Kaliningrad. On 23 November 2011, Medvedev again said that Russia may deploy Iskander tactical missiles in the Kaliningrad region as part of Russia’s reaction to the United States' reformulated missile shield plans. In December 2013, Russia disclosed that the Iskander missile system had been deployed in the Western Military District. In March 2015, there were reports in Russian media that Russia had deployed Iskander missiles to Kaliningrad. In October 2016, there were again reports that the missile system had been deployed in Kaliningrad. Poland called the situation "very alarming". Iskander-M – 9M723 version for Russian armed forces. Range: published 415 km, rumoured 500 km. Flight altitude up to 6–50 km, stealth missile, controlled at all stages, not ballistic flight path. The intense maneuvering on takeoff and descent complicates prediction of target. Missile constantly maneuvers during the flight. Iskander-K (K stands for krylataya or "winged") - 9M728 cruise missiles, flight altitude up to 6 km, automatic adjustment in the way, follow of terrain relief in flight. Range: 500 km. R-500 is a completely different cruise missile, based and evolved from RK-55 3M10 and 3M54 3M14, Kh-101 102 ALCMs. Currently the system includes 5 ballistic and 1 cruise missiles. Russia - 112 units (9 rocket brigades with 12 units each, and one unit with 4 units in Kapustin Yar). In service with the Western Military District since 2010. Also, missiles are deployed in Armenia. Two deliveries in 2013. Missile units in Krasnodar and Stavropol territories as well as in the Republic of Adygea in the 49th Army of the Southern Military District, and a missile brigade in the Eastern Military District received Iskander-M in 2013. One more delivery in July 2014. Missile brigade, stationed in the Orenburg region, rearmed on "Iskander-M" on 20 November 2014. 6th brigade delivered on 16.06.2015 to unit in Ulan Ude. 7th brigade delivered in November 2015 to the Southern Military District. All scheduled 120 complexes. 20th Separate Guards missile brigade - 5th Combined Arms Army of the Eastern Military District (the brigade stationed in Spassk-Far, Primorye Territory) - in June 2016. One more delivery in November 2016 to the Central MD. Armenia - Several systems were displayed at the Independence Day parade rehearsal in September 2016. Two managers of the Russian military-industrial complex Rosoboronexport confirmed that four 9K720 Iskander systems were delivered to Armenia per CSTO arms agreement, thus making Armenia the first foreign state to have the missile system. ↑ "Iskander (SS-26)". CSIS Missile Threat. ↑ "Iskander M/E (SS-21 / SS-26)". Retrieved 23 December 2014. ↑ "Ударная Сила: Ракетная паутина (оперативно-тактический ракетный комплекс 9К720 "Искандер" SS-26 "Stone") » RNNS.RU". Retrieved 8 October 2016. 1 2 "MilitaryRussia.Ru — отечественная военная техника (после 1945г.) - Статьи". Retrieved 23 December 2014. ↑ "Дмитрий Рогозин: "Искандеры" будут размещены в Калининграде". Retrieved 23 December 2014. ↑ "NATO Members Alarmed by Russian Nuclear Missile Deployment". Retrieved 23 December 2014. 1 2 "Россия модернизирует "Искандер"". Retrieved 23 December 2014. ↑ "-". Retrieved 23 December 2014. ↑ "Оперативно-тактический ракетный комплекс "Искандер-Э" - АО Научно-производственная корпорация "КБ Машиностроения"". Retrieved 8 October 2016. 1 2 "Оперативно-тактический ракетный комплекс 9К720 'Искандер' - Ракетная техника". Retrieved 8 October 2016. ↑ "Асимметричный запуск "Искандера"". Retrieved 23 December 2014. 1 2 "Ударная Сила: Ракетная паутина (оперативно-тактический ракетный комплекс 9К720 "Искандер" SS-26 "Stone")". rnns.ru (in Russian). 25 October 2009. Retrieved 23 December 2014. ↑ "ТАСС: Армия и ОПК". Retrieved 8 October 2016. ↑ "Великий воин и защитник "Искандер"". Retrieved 23 December 2014. ↑ "- .name". Retrieved 23 December 2014. ↑ Алексей Михайлов. ""Искандер" стал неуязвимым для американской ПРО". Известия. Retrieved 23 December 2014. 1 2 3 "Ракетный комплекс "Искандер"". Retrieved 23 December 2014. 1 2 "- 9723". Retrieved 23 December 2014. ↑ www.zebra-group.ru, Zebra Group -. "Moscow Defense Brief". Retrieved 8 October 2016. ↑ Official Dutch government investigation stating that SS26 propelled cluster bomb that killed Dutch journalist (PDF) Archived June 9, 2010, at the Wayback Machine. ↑ "Obama cancels missile defense and changes transatlantic politics". The Globe and Mail. Toronto. September 25, 2009. 1 2 Harutyunyan, Sargis (3 June 2013). "Advanced Russian Missiles 'Deployed In Armenia'". Radio Free Europe/Radio Liberty. Retrieved 22 June 2013. ↑ Editorial, Reuters. "Poland and U.S. Army hold joint air defence exercises near Warsaw". Retrieved 8 October 2016. ↑ "Russia deploys nuclear-capable missiles in Kaliningrad". ↑ "В Госдуме раскрыли цели переброски «Искандеров» под Калининград.". Lenta.ru. 2016-10-15. ↑ Russia Deploys New Missiles to the Baltic Sea Region - AP, 2016-11-21. 1 2 "Почему ОТРК "Искандер" так пугает наших соседей". Retrieved 23 December 2014. ↑ "Оперативно-тактический ракетный комплекс 9К720 'Искандер'". Retrieved 23 December 2014. ↑ "New ballistic missile created for Iskander tactical system". Retrieved 8 October 2016. ↑ "Чемезов: ракетные комплексы "Искандер" не пойдут на экспорт". Retrieved 8 October 2016. ↑ "Комплекс 9К720 Искандер - SS-26 STONE - Структура комплекса и хронология - MilitaryRussia.Ru — отечественная военная техника (после 1945г.)". Retrieved 8 October 2016. ↑ "ЦАМТО / Новости / В войска Южного военного округа поступил второй бригадный комплект ОТРК "Искандер-М"". Retrieved 8 October 2016. ↑ "Южный военный округ получил комплексы "Искандер-М"". РИА Новости. Retrieved 23 December 2014. ↑ "По-прежнему боги войны". Retrieved 23 December 2014. ↑ "НПК "КБМ" передала Минобороны третий комплект ОТРК "Искандер-М" для оснащения ракетной бригады". Retrieved 23 December 2014. ↑ "Ракетная бригада ЦВО перевооружена на новейшие оперативно-тактические ракетные комплексы «Искандер-М»". 20 November 2014. Retrieved 23 December 2014. ↑ bmpd (17 July 2015). "Сухопутные войска России получили шестой бригадный комплект "Искандеров-М"". Retrieved 8 October 2016. ↑ "ЦАМТО / Новости / АО "НПК «КБМ" сдало Минобороны РФ шестой бригадный комплект ОТРК "Искандер-М"". Retrieved 8 October 2016. ↑ ""Искандер" научили взрывать метро по фотографии". Retrieved 23 December 2014. ↑ bmpd (29 June 2016). "20-я гвардейская ракетная бригада получила комплект ракетного комплекса "Искандер-М"". Retrieved 8 October 2016. ↑ "ARMENIA RECEIVES FIRST RUSSIA-MADE ISKANDER-M MISSILE SYSTEMS". South Front. 16 September 2016. ↑ "СМИ: Армения получила российские комплексы "Искандер-М"". Vzglyad (in Russian). 16 September 2016. ↑ "Iskander (SS-26 Stone) Short-Range Ballistic Missile". Military-Today. 2010-12-31. Retrieved 2011-05-15. ↑ "9К720 "Искандер" - оперативно-тактический ракетный комплекс". Retrieved 23 December 2014. Wikimedia Commons has media related to OTRK Iskander.